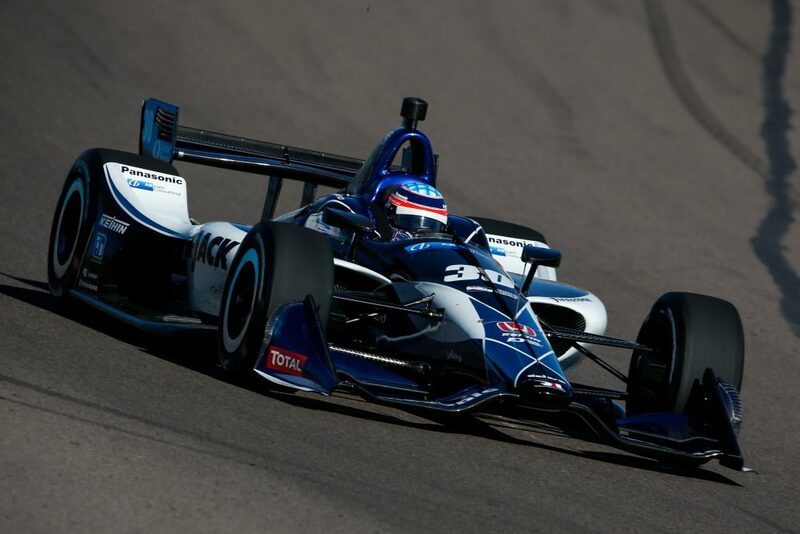 The second day of IndyCar testing at ISM Raceway saw the full 23-car grid run laps in two sessions at the 1.022-mile track in Avondale, Arizona. The first three-hour session included Rahal Letterman Lanigan leading the way, as Takuma Sato posted a fastest lap speed of 187.022 MPH. Following Sato was Team Penske’s Simon Pagenaud. The French driver and winner of the 2017 event at ISM Raceway led the Chevrolet camp with a best overall speed of 186.611 MPH. Rounding out the top five was Tony Kanaan, Matheus Leist and Sebastien Bourdais. The top five drivers were composed of two Frenchmen, two Brazilians, and the reigning Indianapolis 500 winner, the man from Japan. Chevrolet held three of the five top spots as well. Continuing the strong run he displayed during Thursday’s rookie test session, A.J. Foyt Racing’s Matheus Leist was fastest of all rookie drivers during the initial run. Leist was the only rookie to reach the top-10 in the first session as the next fastest first-year driver would be Schmidt Peterson Motorsports’ Robert Wickens, who completed the afternoon portion of the test day in 13th. All 23 drivers completed laps during the first session, and were separated by just 1.5662 seconds. Nine drivers ran laps under the 20-second mark and 20 drivers ran laps at over 180 miles per hour. The season’s initial testing session was completed without incident, as teams and drivers seemed to employ a more conservative approach to the daytime run, particularly with the April 7 race at ISM Raceway scheduled to run at night. The second session would have the full field run under the lights for the first time with the new universal aero kit. The nighttime session featured close racing in similar conditions to April’s event weekend. Rahal Letterman Lanigan Racing would continue to lead the way in the second session of the day. This time, Graham Rahal would lead a 1-2 for the team with Sato being second-quickest. Pagenaud would again have the fastest Chevrolet-powered car, with defending series champion Josef Newgarden placing fourth and Kanaan slotting fifth. As in the afternoon session, Chevrolet engines powered three of the top five cars with Honda powering the other two. 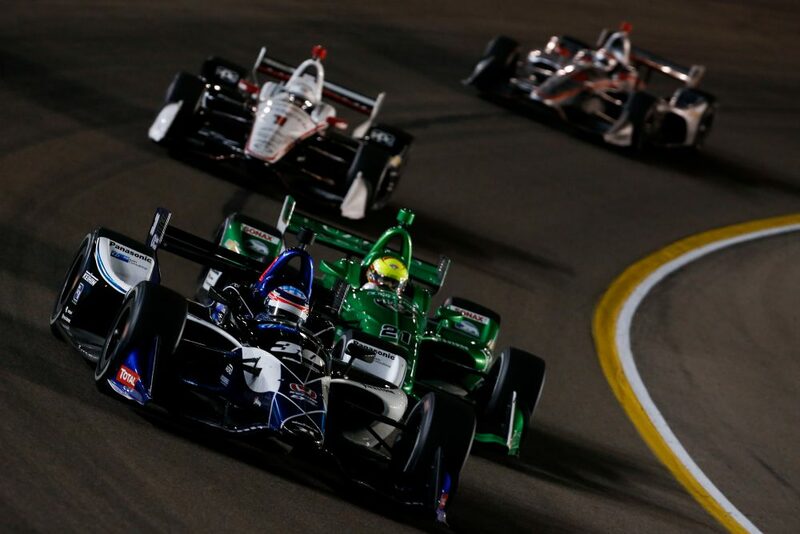 Leist would once again be the fastest rookie of the session, as he would end the night 10th, three spots ahead of Ed Carpenter Racing’s Spencer Pigot. Despite the early success, the Brazilian rookie would bring out the only incident-related caution of the day. With less than a half-hour remaining, Leist got loose and spun off of turn two at the dusty ISM Raceway. Fortunately, his car would not sustain damage and after replacing multiple flat tires, he finished the evening without further incident. As anticipated, speeds rose significantly throughout the field during the evening session. The 23-car group was separated by just .8833 seconds, with all drivers eclipsing the 180 MPH barrier and 15 drivers running laps under 20 seconds. An interesting note to follow for Saturday’s final two sessions: there were many cautions for debris and track inspection on Friday, and track officials noticed some crumbling of the racing surface near the start/finish line. Sealer was laid down overnight to try and remedy the issue in the short-term, so keep an eye on that as we continue this weekend. Like Friday, Saturday will also feature test sessions from 3:00-6:00 p.m. and 8:00-11:00 p.m. Eastern time (1:00-4:00 PM and 6:00-9:00 PM on local Mountain time). The test sessions will be open to the public, as ISM Raceway hosts its 3rd annual “Prix View” in anticipation of the April 7 race at the track. Fans will also enjoy a driver autograph session between the two on-track time blocks, so come on out to the racetrack for some February fun.